The KNX presence detector mini with integrated bus coupling unit, available in Standard and Universal versions, supports operation of lighting equipment, room thermostats and other electrical loads to suit users' needs. Its compact structure comes with three options for ceiling installation: in a false ceiling, surface mounting or in a standard flush wall box. Depending on its configuration, the presence detector mini can be deployed for determining movement as a ceiling observer, for evaluating the presence of people and for room surveillance in signalling mode. Using software to switch on several devices in parallel enables the detection area to be extended as required, with several devices set up as satellite units being combined with a master device. The five functional blocks of the Universal version work independently of each other and can be switched between day and night operation. Each functional block can be configured as required for presence detector, ceiling observer or signalling mode, so that different tasks can be fulfilled with only one device that operates in the different areas of the room. If required, regulation of lighting is also possible depending on daylight. Additionally the three PIR sensors with a total detection area of 360° can be individually analysed as required by software, so that the "view angle" of the sensor technology can be influenced for each parameter. The setting and operation of the Universal version can optionally be carried out through infra-red remote control. With the KNX brightness control with integrated brightness sensor, the interior light control depends on the amount of daylight present. 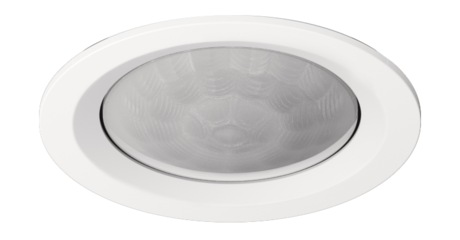 This has the same three options for ceiling installation as the presence detector mini: surface-mounted, flush-mounted or in a false ceiling. The brightness sensor with its harmonious proportions, "invisible" adjustment elements and sensor technology features an unoptrusive design. The KNX Standard/Universal presence detector impresses by excellent detecting properties for mounting heights of up to 5 m, compact design with built-in bus coupler as well as by the capability of presence-based constant light control (Universal version). Additionally, the Universal option has five functional blocks that operate independently of each other and to which three PIR sensors may be allocated. Each functional block may be configured for use with the presence detector, ceiling detector, or signalling application. The unit may be optionally set up and operated using an IR remote control. A protective cover made of solid steel is available as an optional part for the KNX presence detector / ceiling detector. This cover protects the unit against damage, for example, from thrown balls if it is installed in a sports hall. 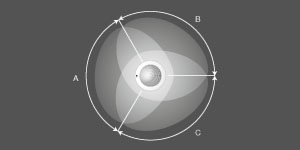 The 360° detection angle can be divided into three separate 120° portions that can be enabled individually by the relevant one of the three PIR sensors. In addition, these sensors can be evaluated individually as required in software so that the “direction of viewing” of the sensors can be modified per parameter (Universal version). 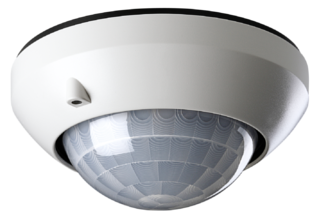 The presence detector / ceiling detector has an especially homogeneous detection area of around 20 m (when installed at a height of 5 m). This allows precise motion detection, even in large rooms.